Back in 1957 a British naval historian named C. Northcote Parkinson came up with an argument that members of organisations tend to give disproportionate weight to trivial issues, and he explained the concept by using the example of a fictional committee whose job was to approve the plans for a nuclear power plant who, instead, spent the majority of its time on discussions about relatively minor but easy-to-grasp issues, such as what materials to use for the staff bike shed, while neglecting the proposed design of the plant itself, which was a far more important, and a far more difficult and complex, task. It’s something we all do, to some extent or other, when we’re building bikes too. How many times have you found yourself in your own shed (bike-shedding in a totally different context) looking at your partly built (or even not yet started) project and, instead of getting on and getting stuck into the large lumps, you find yourself spending the time thinking about paint details or seat colour or what jacket you’re going to wear when you’re out riding so that you and the bike both look the part. There’s nothing wrong with doing it… as long as you do eventually get on and do what actually needs to be done. 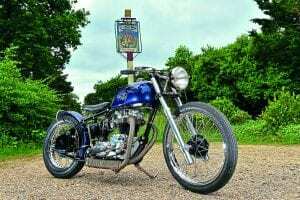 While he’s not mentioned it, I suspect that Steve Talbot, the owner and builder of this rather gorgeous lil’ Triumph bobber, is as guilty of it as anyone else when he was creating the vision of Meriden-based loveliness you see before you. It’s difficult not to, isn’t it? No matter how focused you are on a task, it’s all too easy for the mind to wander ahead to the last stages, or even the end, of the build when all the hard work’s done and the end of the project is, if not in sight, a hell of a lot closer than it is at the precise moment you’re thinking about it. Once he had it safely ensconced in his good friend Terry’s shed (it’s to do with house moves and convenience, don’t worry about it), he gave it a good looking-at. A friend from work suggested a Yamaha YZ490 front brake would give the correct period look (and a brake that works), so he decided to have the whole front end from said insane ’crosser. 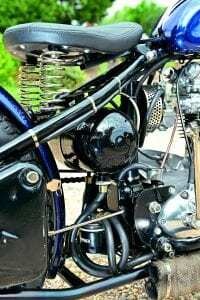 The wheel was rebuilt with stainless spokes and fitted with a suitably olde-skoole Speedmaster tyre, and bushes were made for the head bearings (the headstock hasn’t been altered), the stanchions shortened to suit, and an autojumble headlight with brass-rimmed ammeter fitted using BSA Gold Star-style brackets. 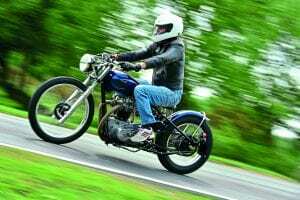 His local autojumble was, he says, a constant source of parts for the build, including the Triumph petrol tank that’s been modified to fit and fitted with a brass Monza cap, the James (or Excelsior, he isn’t sure which) tool box that’s been pressed into use as a battery/electrics box, and the BSA Bantam tail-light. 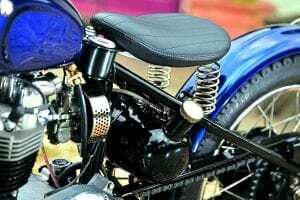 The sprung Baron’s Speed Shop seat was re-covered, and their oil tank fitted with an extended neck and a brass filler cap. All of this is, of course, easier said than done but fortunately, he says, there are a lot of skilled people about, one of whom is his good friend Keith who’s a dab hand with a welder. Steve says that he couldn’t have done it without him, even after he (Keith) told him (Steve) that he was never to touch a welder again after some of his efforts! 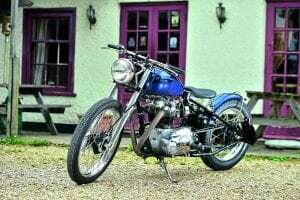 The TR6 motor too has received much attention. Paul Sands of PJS Motorcycles, a man who’s no stranger to customs himself, having built a nitrous oxide-injected FireBlade sidecar outfit that was featured in Streetfighters and a pair of Outlaw drag bikes, carefully rebuilt it with a 750cc Morgo big bore kit and various other choice parts, and he also wired the bike up too. 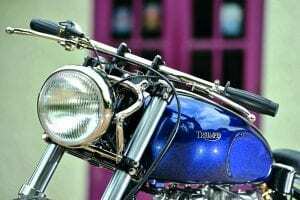 To finish off, the paint was contracted out to a local spray shop who laid down the metallic blue the tank and mudguard so resplendently wear, lacquering in the tank decals which are Triumph copies reduced in size with an old English white edging. On one of the early rides he was unfortunate enough to get a puncture and, when he finally got to a garage, a car garage, the owner was really helpful. 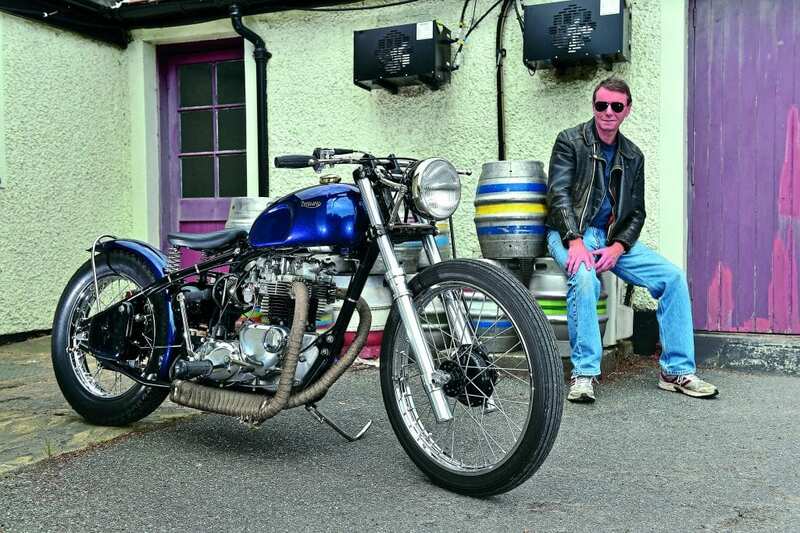 They got the bike into his workshop, but moments after Steve’d put the Triumph on its side-stand, it fell over and landed on a classic Jaguar – oops! Sometimes, it seems, it doesn’t pay to be helpful, does it? Since these pics were done, the exhaust has been changed to a high-level Siamese system with a short silencer. This was done because, although the ’pipes in the pics aren’t exactly low, they kept grounding out on bends (as you can see from the scags in the wrap). Hmm, and they reckon those Avons don’t handle, eh? 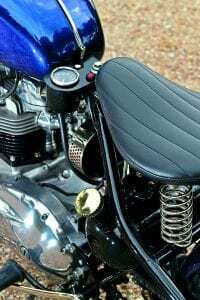 Having had the bobber on the road for a while, Steve’s now considering a change and he’s thinking of selling so, if anyone is interested, call him on 07761 923584. I’d be quick though ’cos I suspect it’ll get snapped up – get dialling, don’t shed!